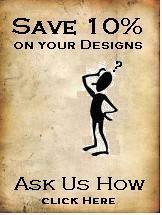 Perfect Home Hvac Design isn't just about our design services. Take a leisurely stroll through some of our Consumer Information pages. I see your journey down the lane of hvac design has brought you here. 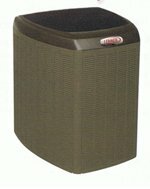 A conventional split system or package air conditioner must be on your wish list for your Castle! This is where Manual J calculations and Manual D calculations are most critical. I have said it before and I will say it again! A quality installation begins with a professional design. A professional design begins with a quality load calculation. Forced air heating systems can be very forgiving on the operation end, if the design and sizing is not quite optimal. A furnace will usually just cycle on and off often, and cost you more money at the utility meters, if it is not sized properly. A conventional freon based air conditioner, on the other hand, is very unforgiving. A bad air conditioner design, incorrect equipment sizing, improper ductwork sizing, and/or poor installation can cost you dearly. Any one of these factors can contribute to improper air flow and can simply freeze up your air conditioner, and it won't perform! Always insist that your hvac contractor perform a Manual J calculation, a Manual D calculation, and that he follow them. Inefficient operation costing you cash at the meter. Oversized air conditioners will short cycle, not only costing more to operate, but will shorten the life of your equipment. An improperly sized air conditioner may not cool your home properly. "Doing a design today, will keep the serviceman away". Improperly sized or installed equipment tends to fail frequently. Hot and cold spots. Hot and cold rooms. As I have stated before, it is not our intention in these pages to turn you into an HVAC expert. We hope to provide for you enough basic information to make you "dangerous" when dealing with those hvac contractors. You will be "dangerous" if you exhibit knowledge about the service you are considering purchasing, and if you demand the proper calculations be performed. The "Rule of Thumb" guy and the "Point and Grunt" guy will run! Sometimes I go off on tangents! Please forgive me! May I inject a slice of my personal philosophy? The bitterness of low quality remains long after the sweetness of low price is forgotten. Back to our purpose here. Heat will always try to move to a colder object. It cannot be stopped. It is simply a law of nature. When your home is cooler inside than it is outside, the outside heat will try to invade your home. This is "Heat Gain". Manual J rates this heat gain in btu's per hour. This is the main factor determining your home's air conditioning requirements. The opposite to this is winter. When it is hotter inside than it is outside, the heat will attempt to transfer to the outside. This is "Heat Loss". Heat loss will be discussed further in our heating pages. Remember when you were a kid, and your Dad would yell at you to close the fridge door, "You're letting all the cold air out!" You were actually letting all the hot air in. The hot air was rushing in trying to equalize with the cold air. Well, of course, as it did so cold air was being displaced, as well. The process we just touched upon is "Heat Transfer". This heat transfer can be kept in check and inhibited by precautions you take, or your builder anticipates, or precautions undertaken by other tradesmen you may hire. Higher insulation R-values, higher U-value windows, and sealing your home against air leakage will help keep the heat where you want it. A comfort system's main purpose is to slow heat transfer, yet still save you money at the meters. The drawing above is a typical split system air conditioner. Split system means simply that the two main components are located in different locations. 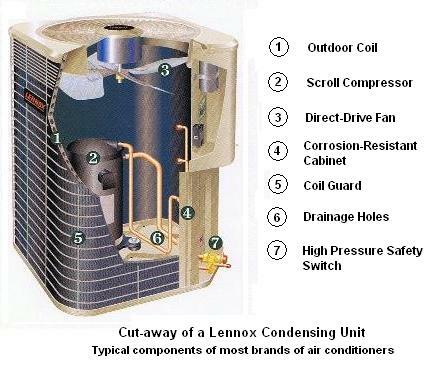 The typical central air conditioner has an outdoor condensing unit and an indoor evaporator coil. The evaporator coil can be an integral part of an air handler or it can be an added component to a furnace. The two components are connected with copper refrigeration lines, which basically, transfer heat to the outside, via freon. 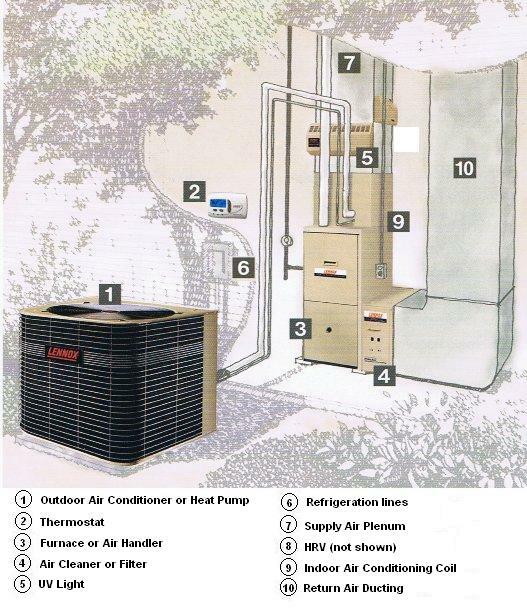 The efficiency of an air conditioner is rated in SEER and EER. The higher the SEER rating and EER rating, the higher efficient the unit and costs you less to operate. Most folks believe that an air conditioner cools their home by pumping in cold air. Well, that's not quite how it works! Keep in mind: Cold Is The Lack Of Heat. What's really going on is your air handler/furnace is blowing indoor air across the indoor evaporator coil. Indoor heat is transfered to the freon which is flowing through the indoor evaporator coil. The heat laden freon then flows back out to the outdoor condensing unit, which then dispells the heat to the outside, via the outdoor condenser coil. Both the indoor evaporator coil and the outdoor condenser coil are very similar in function to the radiator of your car. Heat transfer is taking place. The picture here is an indoor A-coil. This one is uncased and is built directly into the plenum. Indoor coils can also be purchased built into a case, which installs directly to your air handler or furnace. Next time you are near an outdoor condenser, put your hand over the top of the unit. The air blowing out is hot. This is literally the heat from inside which has been transferred, via freon, to the outside. This process is certainly a bit more complicated. We could discuss thermal expansion valves and compressors, but I think you now have enough info to be "dangerous"! When you are interviewing potential hvac contractors, you will hear phrases such as total cooling capacity, sensible and latent capacity, btu, and tonnage. The Air Conditioning Contractors of America (ACCA) have a consumer area on their site which explains these terms very well. They also have a Quality HVAC Installation checklist which is worth it's weight in gold! Let's quickly go over a few of these terms. Total cooling capacity is actually the sum of two factors, sensible cooling capacity and latent cooling capacity. Sensible cooling capacity is the air conditioner's ability to remove heat and lower temperature. Latent cooling capacity is the unit's ability to remove humidity from inside. This moisture, as it passes through the indoor evaporator coil, is collected and discarded through the condensate drain. The drier the climate, the less important latent capacity is. British thermal unit (btu) is the amount of energy it takes to heat 1 pound of water from 60*F to 61*F.
AC tonnage is the amount of power needed to melt one short ton of ice in 24 hours. 1 ton of cooling equals 12,000 btu. Most residential air conditioners do not exceed 5 tons of cooling. Air flow per ton is 400 cfm (cubic feet per minute). It is good practice to design a duct system for 400-500 cfm delivery on both the supply side and the return side. Now let's talk a bit about infiltration. Infiltration can be a major factor adding to heat gain or heat loss in your home. Infiltration is the amount of outside air which sneaks into a home. Sources of infiltration can be fireplaces, seals around doors, cracks around windows, or even outside air purposely induced into your home for ventilation. Some time spent sealing well around these areas can be time well spent, and can have a noticeable impact on the performance of your air conditioner or furnace. While we are on the subject of infiltration, new homes being built nowadays are much tighter construction. It is a good idea to have some type of mechanical ventilation to bring in fresh outside air and dispell stale air to the outside. See our Indoor Air Quality page. I mentioned earlier that the indoor evaporator coil and the outdoor condenser coil are very similar to a car's radiator. This is very true! The air passages through both the indoor evaporator coil and the outdoor condenser coils are very small. The outdoor condenser coil can become clogged by blowing debris, such as the cotton which comes off of cottonwood trees, or grass clippings. The indoor coil (pictured earlier on this page) can become clogged by a build up of dust and debris from inside your ductwork, especially if your filter has been neglected. It is very important to change your furnace or air handler filter often! If the air passages in your coil get clogged or if your filter needs changing, your air conditioner will not perform. Neglecting these items will bring the serviceman a'knockin' at $89.00 per hour. A few years ago, it was determined that some freons (hcfcs) were creating, or adding to a hole in our ozone layer. I don't know about you, but I like my ozone without any holes in it! It was decided to phase out ozone depleting freons. R22 is one of those ozone depleting freons. Up until now, R22 has been the most common freon used in residential and commercial air conditioners. On Jan. 1, 2010, The phase-out of R22 AC units begins. R22 Ac units will no longer be manufactured or imported here in the US. Go to our R22 phase-out page to read more about the EPA's plan. For a more extensive discussion on efficiencies, multi stage equipment, and higher quality equipment, Click here for our SEER and EER page. If you do install a high efficiency AC unit or furnace, it might be worth a trip to our Rebates and Tax Credits page, to see the programs available to you to Save Big Bucks!